Primeiro de tudo, gostaria de dizer que sim, vai ser possível disparar contra o nosso tablet. À uns meses atrás, uma empresa Israelita, XnTouch, anunciou que estava a desenvolver uma aplicação para tablet, bem como uns dardos especiais, destinados a serem disparados contra um tablet. E então, foi criada a SNIPE. O que é a SNIPE? A ideia por detrás da SNIPE é podermos levar a experiência de tiro ao alvo com dardos de espuma a outro nível. Utilizando dardos feitos de uma forma inovadora, vamos poder utilizar um tablet comum como alvo. A SNIPE é a combinação perfeita de entre elementos físicos e digitais do tiro com dardos de espuma. Os dardos são feitos de materiais condutores da eletricidade, com pontas inovadoras, com design em epiral, compatíveis com a maior parte dos lançadores já disponíveis e com patente em espera. Estes dardos vão permitir disparar contra o nosso tablet sem o danificar, visto que só produzem uma força de impacto de cerca de 8 gramas e um ecrã de um tablet está preparado para sofrer forças até 14 gramas. Atualmente, não existem aplicações de tablet que permita a utilização deste dardos de última geração, por isso, a SNIPE também criou uma. Um dos vários cenários, é disparar contra uma pirâmide de latas, evitando acertar em latas de TNT. Neste e nos outros cenários, a SNIPE inclui efeitos especiais, gráficos reais, e aspectos inovadores em cada um deles. Uma das coisa que a SNIPE também criou são os seus próprios lançadores de dardos, bem como suportes para o tablet. YOU’RE AWESOME TOO! Thank you for your support. You will appear in our ‘SNIPERS’ page within our apps and website, and receive a personal thank you from the SNIPE Team. BULLSNIPE – Not a shooter but want to have some fun? Get three (3) SNIPE blowing Touch Darts (not applicable to blasters) for playing Toto bulls-eye with your tablet, and free access to the ‘BULLS-EYE’ SNIPE App. SNIPE RECRUIT – Feel like SNIPE is way above your shooting skills? Start your sniping career with one (1) SNIPE Single Blaster and ten (10) SNIPE Touch Darts, (1) SNIPE Table Mount with free access to all of the SNIPE Apps. SNIPER KIT – Ready to challenge your sniping skills? Get one (1) rapid-fire SNIPE Blaster, fifteen (15) SNIPE Touch Darts, one (1) SNIPE Table Mount with free access to all of the SNIPE Apps. 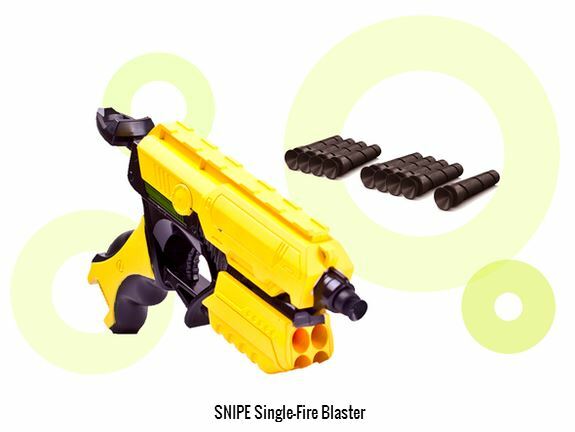 sNERFER KIT (EB) – If your’e a quick decision maker and already have your own blaster to shoot SNIPE Darts with? Well, this pack is for you! 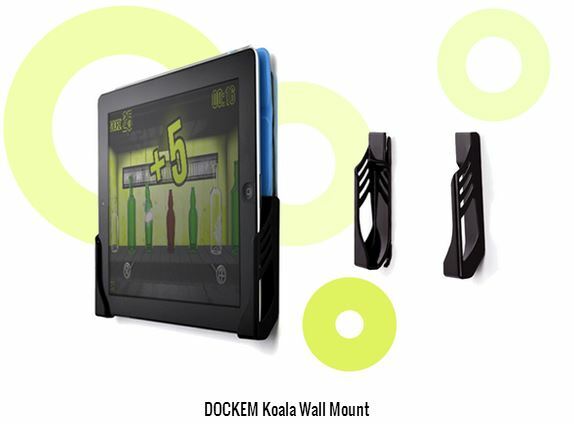 Get fifty (50) SNIPE Touch Darts, one (1) SNIPE table mount, (1) one Dockem wall mount, with free access to all of the SNIPE Apps. 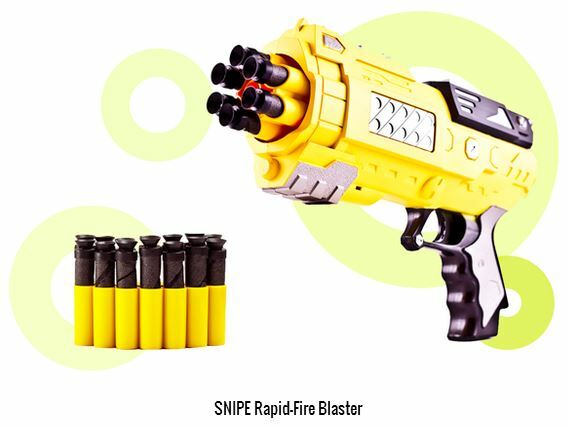 sNERFER KIT – Already have your own crazy blaster to shoot SNIPE Darts with? Well, this pack is for you! Get fifty (50) SNIPE Touch Darts, one (1) SNIPE table mount, (1) one Dockem wall mount, with free access to all of the SNIPE Apps. ULTIMATE SNIPER KIT (EB) – YES! That is the package for you… and if you’re quick you’ll get it in the best price possible; Get thirty (30) SNIPE Touch Darts, one (1) SNIPE table mount, two (2) Dockem wall mount for your office and living room, one (1) SNIPE ammunition belt to hold 12 snipe darts to help you reload faster, one (1) carry on SNIPE bag to carry your SNIPE game set, with free access to all of the SNIPE Apps. 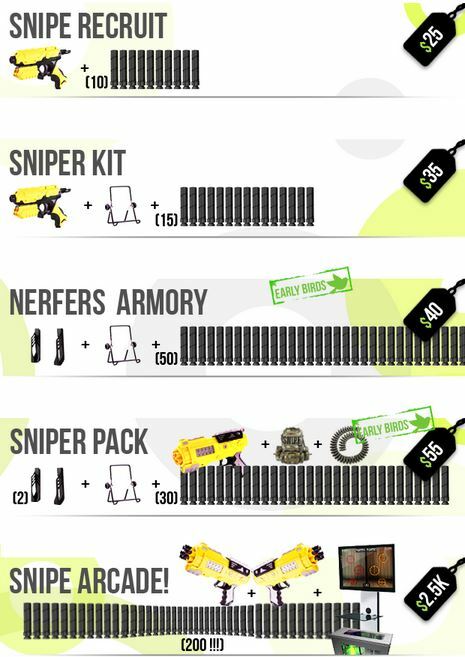 ULTIMATE SNIPER KIT – YES! That is the package for you… and if you’re quick you’ll get it in the best price possible; Get thirty (30) SNIPE Touch Darts, one (1) SNIPE table mount, two (2) Dockem wall mount for your office and living room, one (1) SNIPE ammunition belt to hold 12 snipe darts to help you reload faster, one (1) carry on SNIPE bag to carry your SNIPE game set, with free access to all of the SNIPE Apps. 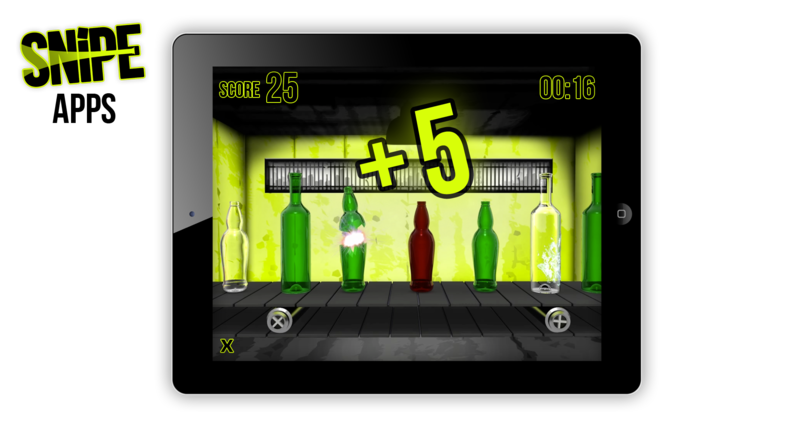 THE DUEL KIT – It’s time to beat your sworn enemy in a heads-up shootout! Get two (2) rapid-fire,, SNIPE Blasters, fifty (50) SNIPE Touch Darts, two (2) SNIPE table mounts, two (2) Dockem wall mounts, two (2) SNIPE ammunition belts, each can hold 12 snipe darts to help you reload faster, with free access to all of the SNIPE Apps. KICKSNIPER EDITION (limited to 100) – Stay unique, by having what no one else has! 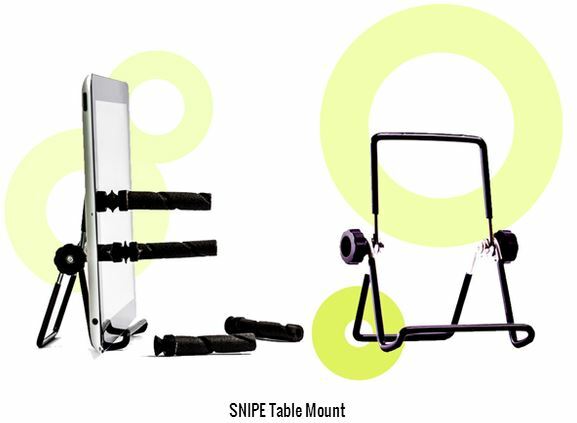 Get one (1) rapid-fire Limited Edition SNIPE Blaster, twenty (20) SNIPE Touch Darts, one (1) SNIPE table mount, two (2) Dockem wall mounts, one (1) SNIPE Bond suitcase to carry your SNIPE gear and tablet, with free access to all of the SNIPE Apps. DEVELOPER WAR ZONE (limited to 30 that needs our approval) – Have the ambition to develop your own SNIPE App? 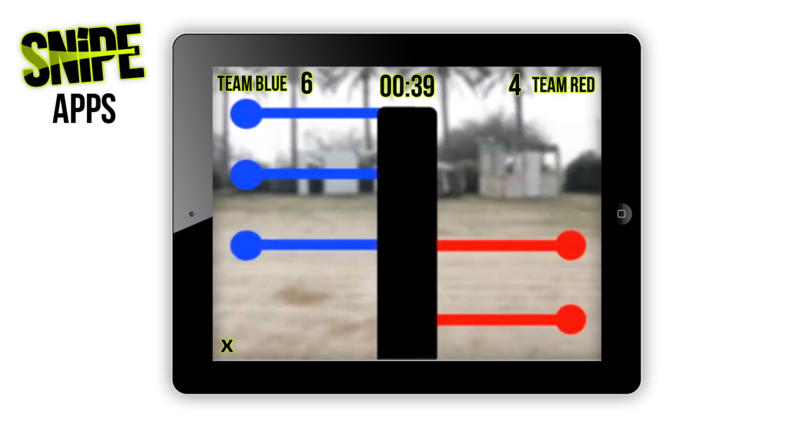 Get the SNIPER KIT a month before other backers, present your future app on SNIPE’s packages and website, maybe even get a license to use SNIPE’s brand, graphics, Statistics and data for your awesome new app. SNIPE MEMBER OF HONOR (limited to 10): Want to become a collector of SNIPE’s unique stuff? Get one (1) of the blasted tablets that were shot during the filming of the SNIPE movie, frames and signed by the SNIPE team members with your name on it! Also, we’ll put us in our credits section within SNIPE website, and on the way we’ll send you the KICKSNIPER KIT! SILVE SPONSOR (limited to 50): Care to get your company famous? Your company’s name and logo will appear at one of SNIPE’s Apps 2nd opening screens as sponsors, next to other 9 companies that will join this reward. SNIPE ARACDE SYSTEM – If you’re a pub owner, CEO of an awesome company or the famous Dan Bilizirian, this reward is for YOU! Get the world’s first SNIPE Arcade, consisting of 32’’ HD LCD Color Touchscreen Display, three (3) rapid-fire, SNIPE Blasters, 200 SNIPE Touch Darts, while all of that is positioned in one massive arcade system construction, designed especially to make you life awesome! Sem mais nada para apontar, vou dizer a todos os meus amigos, para ajudarem este projectos, e espero que vocês também o façam. Uma coisa tenho a certeza, a SNIPE vai revolucionar o modo de praticar tiro ao alvo, fazendo com que este seja bem mais divertido, estando sozinhos ou com amigos! First of all, I would like to say that, it will be possible to shoot your tablet. Some months ago, an Israeli company, XnTouch, announced they were developing special darts, meant to be fired to a tablet, as well as a tablet app. And so, SNIPE was born. The story behind SNIPE is to take the target shooting experience to a whole new level. Using innovative darts, we wil be able to shoot a tablet. 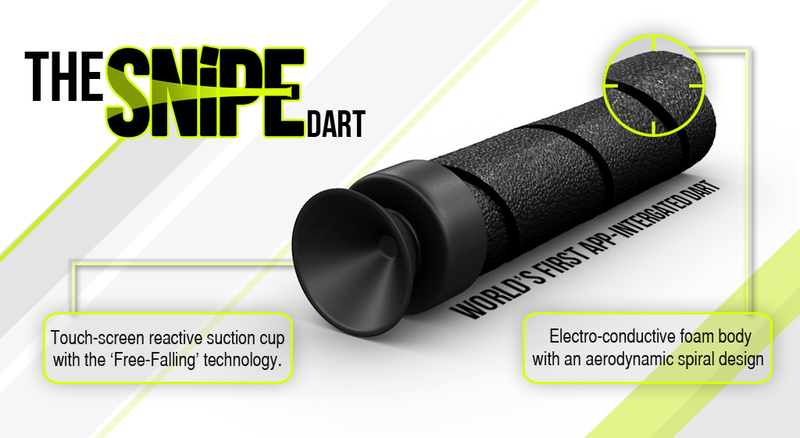 SNIPE is the perfect combination between phisical and digital elements of shooting foam darts. The darts are made of electricity conductive materials, with innovative tips, spiral body design, compatible with most blasters and with Patent Pending. This dart will be able to be shooted to tablets without damaging the screen, bacause their impact force is only 8 grams and tablets are mean´t to be used with forces of 14 grams. Up till now, there is not tablet app that allow this last generation darts to be used, so SNIPE, also created one. 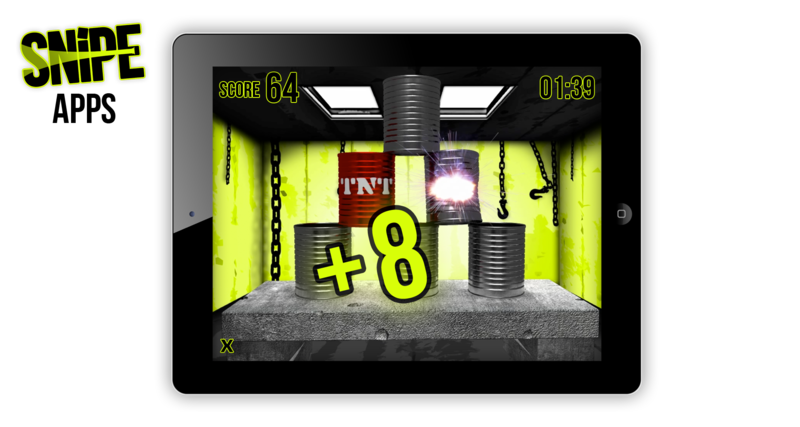 One of the different apps, is shooting against a pyramid of cans, without hitting the TNT cans. In all scenarios, SNIPE includes special effects, real grafics, and many innovative aspects in each one of them. One of the things that SNIPE also created are their own Blasters, as well as tablet mounts. And, without no further ado, I will tell all my friends to help this guys in this project, and hope you do to. One thing I´m sure, SNIPE will revolutionize the way to pratice target shooting, make it more fun, being alone or with friends! This entry was tagged Blaster, Dart, ExtremeNerf, Kickstarter, Nerf, Nerf Portugal, Project, SNIPE, Tablet, XnTouch. Bookmark the permalink.